How did a materials-handling engineer get asked to design stadium roofs and ferry wharves? By keeping his eye on the ball and recognising opportunities to pursue innovative design. 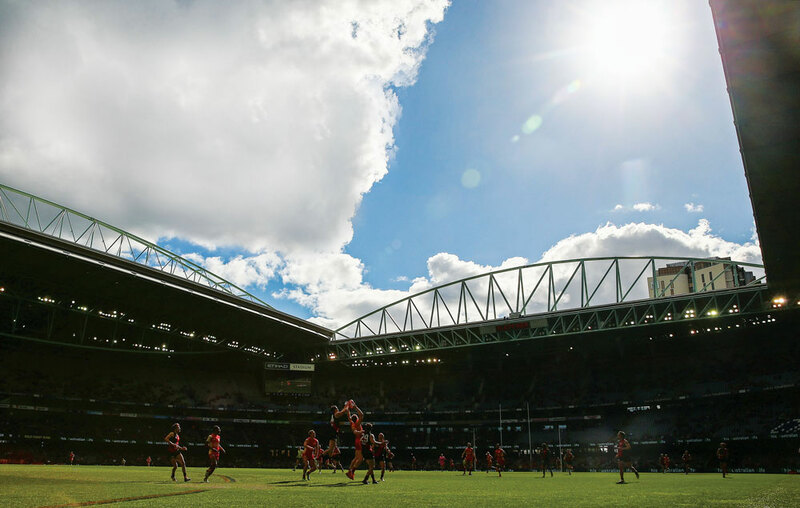 Back in the 1990s when Connell Wagner (one of Aurecon’s forerunners) pitched for the job on the roof at Docklands Stadium in Melbourne, the team there had no experience in this area to bring the innovative design to life. Luckily, it had a mechanical engineer in Queensland who had done a lot of work on large stockyard machines weighing 1000 t, which arguably have greater design challenges than those facing the roof at Docklands. “We put the case that it was actually less complex than these big, moving, materials handling machines that we had done a lot of,” said that engineer, John Leech. “It spans the length of the field, 165 metres, so it’s a massive span, and the whole problem was, what happens if one side stops for some reason, and the other side keeps driving? You can generate massive loads,” he said. The retractable roof at Docklands Stadium in Melbourne spans 165 m.
Now, when Aurecon pitches for jobs like redesigning the retractable roof on the Rod Laver Arena in Melbourne (which they won), it can point to a lot of experience in this field both in Australia and overseas. 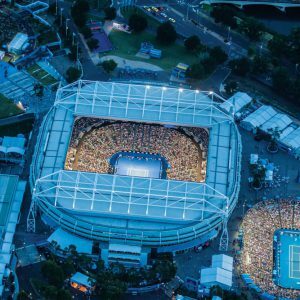 The same design principles from the Docklands work will apply on the roof upgrade job at Rod Laver Arena, which won’t be finished until after the 2018 Australian Open. “We’re following the same philosophy as we used on the previous roofs in terms of allowing them to articulate freely without any destructive loads coming into place,” he said. He explained that, because it was the first moving roof in Australia, it was built using state-of-the-art technology for the time, but it was very slow. It takes 25 minutes to go from fully open to fully closed. For contrast, Margaret Court Arena takes just four minutes. “I think that’s the case with most students who go into engineering,” he said. That work experience was with Macdonald Wagner and Priddle (MWP, a forerunner of Connell Wagner and Aurecon) at the Dalrymple Bay Coal Terminal (DBCT) near Mackay in northern Queensland. Following graduation, MWP welcomed him back as a permanent engineer and he began to specialise in materials handling. He said this was a valuable learning experience where he began to apply the skills he had learned at university. “In bulk materials handling, you’re often working on big projects, so when you come in as a graduate, a senior engineer has usually worked out what needs to be done, in terms of the type of equipment, its handling rates, speed, control requirements,” he said. Although he was going by the book at this stage of his career, Leech was also watching how the more senior engineers approached their tasks. He realised that to be successful, he had to be more creative in his solutions. 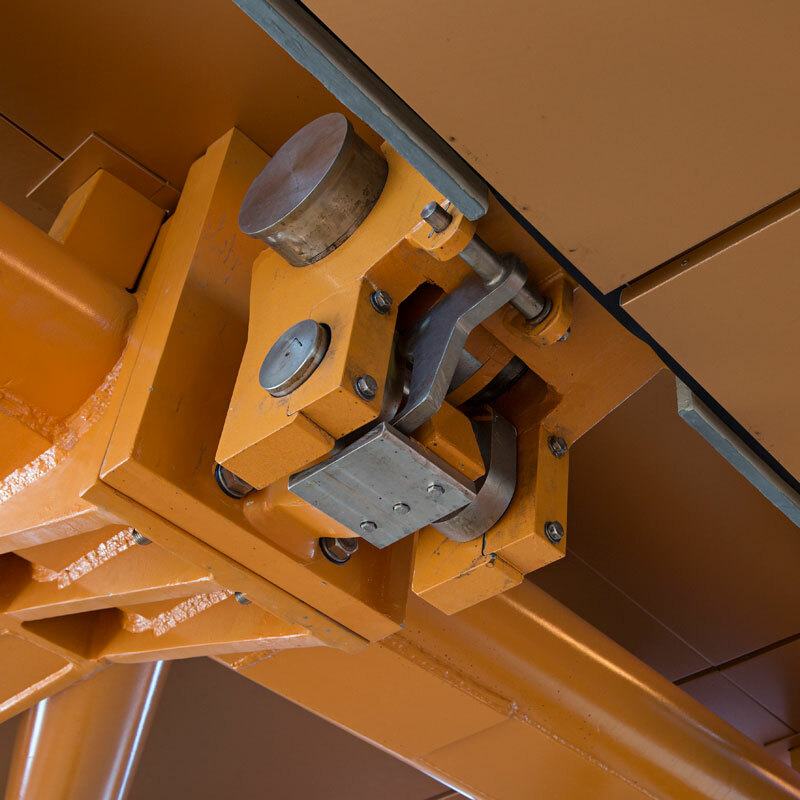 Leech said he was inspired by an engineer called Alan Huth at the RG Tanna Coal Terminal in Gladstone, who had developed a retractable tripper to divert material on the conveyors when needed. At DBCT, Leech needed to take a diversion off a conveyor partway through the process. He knew he needed something like Huth’s tripper but different because Huth’s solution wouldn’t work in that situation. “It was the way we actuated it, that I think was the difference,” he said. The Australian Open with the Rod Laver Arena roof wide open. Leech said engineers do incremental innovation all the time, often just small changes to make something operate smoother or faster – but it’s still innovation. “You’ll normally do some sort of incremental innovation because it’s safe. You can usually predict the outcome, you know it’s going to be better than what was done before, and you’re normally not bringing in any new risks,” he said. He gave an example of another tripper they began developing at Dalrymple Bay. “We had to put a tripper into an existing set of in-loading conveyors at DBCT,” he said. 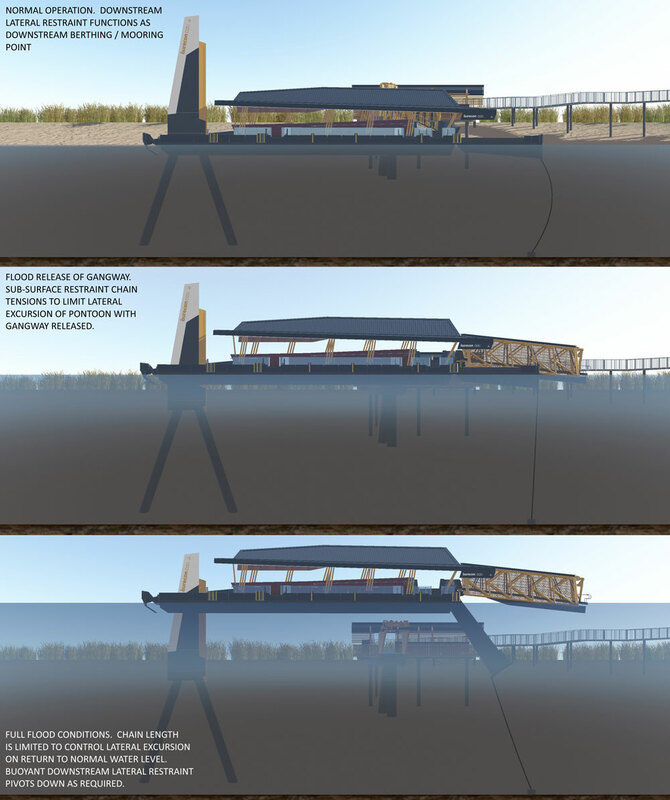 “This was an idea that would have allowed us to do all of that work within two trestles. We didn’t have to touch the rest of the conveyor,” he said. These days, Leech is a design director at Aurecon, a role he said has been created for projects that have an especially challenging technical aspect to them so the design director can oversee the technical output and help foster innovative thinking. The job, he feels, best exemplifies this approach is the redesign of the Brisbane ferry terminals. “They wanted us to come up with a solution that was resilient, that they could put back into action quickly after the floodwaters had receded,” Leech said. Leech says the process for coming up with the design was very much a team effort. A closeup of the gangway flood release on the Brisbane Ferry terminals. He believes the key to coming up with an innovative solution is for the whole group to understand the problem. “To get behind the immediate problem or thing that they might be trying to design, you need to really understand what is it about the client’s production method, or their materials handling, supply chain, or in the case of the ferries, what is it we’re actually trying to do,” he said. He also believes engineers should be trying to think innovatively from the moment they join the company, even if they’re new graduates. “I think it’s just getting them to question whether it is the right solution, and literally asking them, ‘What is the problem we’re really trying to solve? That is a good way of doing it, but is there another way?’,” he said. “Lay people are used to having products all around them that just work,” he said. He said Aurecon recently set up an academy to help teach its engineers to communicate ideas better to clients and the general community, a subtle skillset not unlike a language translator, involving listening and explaining without using foreign terms. “There’s a big section on storytelling,” he said. “Most of the public will just go, ‘Oh, yeah, the roof’s closing. I’m going to get a bag of chips’,” he said.